Today, health-conscious Americans are involved in a serious love affair with yoga. Passion devotees of the world’s strongest country happily bend themselves into positions that look awkward and impossible. And we cannot say that the craze is worthless. There are plenty of valid reasons to give into this craziness: incredible health benefits, improved flexibility, strength, and muscle tone. While you can make your body sweat at any yoga studios next door, the best one of them enhances the best experiences that take you to the new level. What’s the recipe in a great studio for yogis? Start with renowned teachers and techniques, a supportive community and healthful amenities just to sprinkle in some fun and innovative events. To help you select a good place to learn yoga from in America, here is the list of top 5 Yoga Centers people love in the USA. It’s perhaps the most iconic Ashtanga studios in the world. The founder couple- Kino MacGregor and Tim Feldmann are wholeheartedly dedicated to bringing Ashtanga yoga to everyone from all walks of life, and from beginner to advanced practitioners. And your teachers would be Sri K. Pattabhi Jois (1915 A.D.-2009 A.D.) and his grandson R.Sharath Jois. How cool is that! Miami Life Center focuses on a traditional setting where yoga postures, alignment, breathing, meditation, and philosophy are taught and cultivated. Their classes are differentiating into 3 different levels for beginners, intermediate and advanced along with a community class. The list cannot move on without mentioning the gorgeous state of Hawaii. This Hawaiian studio offers beachfront yoga classes for all levels. Wait there’s even more! jungle waterfall mindfulness walks, sunset yoga classes and meditation retreats of all kinds is included. Into the wild scene and adventure along with your yoga classes sounds prodigious, doesn’t it? And what could be better than calming your mind and soul in front of the natural paradise? It’s heading to the spa for a steam room detox and chilling in an oceanfront lounge room with some tea and fruit after the classes end. They offer both private classes and group classes. Amrita Yoga is known for the coolest interior design, coated as “the Lexus of yoga studios”. With skylights, an indoor waterfall, roaring fireplaces, and plenty of natural stone, this place gives you that feeling of beautiful, magical escape from the city. The classes are designed in three categories: Brown, green and red-moving from simplest to harder. Welcoming classes (yoga 101), beginner hot flow, pilates mat, yin, Iyengar level 1, Aerial yoga, Hatha flow, flow & roll and so on. Amrita Yoga classes also have a special class for focus on alignment through sequencing and yoga for back pain. And once you get your sweat on, you can have a full-body massage by one of their trained masseuses. 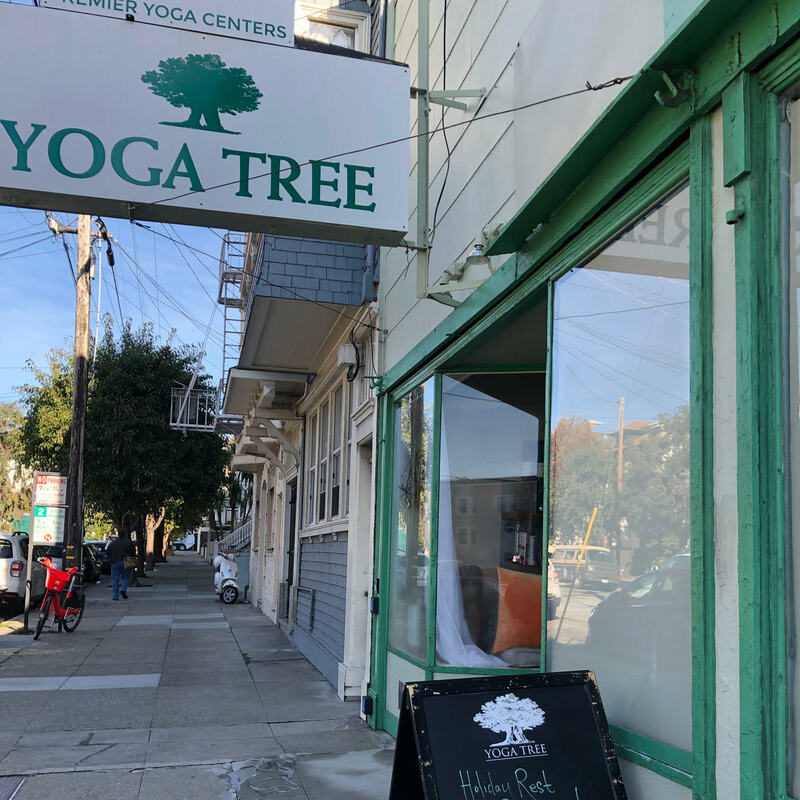 Yoga Tree, San Francisco Bay area’s premier yoga center has 7 diverse and local yoga studios featuring the top yoga teachers from across the globe. Yoga Tree motives “to honor and embrace each student’s search for personal growth, well-being, and fulfillment”. They have the highest quality yoga programs for people of all ages and walks of life. Their classes are scheduled for all day long and you have to reserve in advance. You can book your first-month class at $155 or just drop by for a day to check how they work. From Pre-Natal, Iyengar to Ashtanga Vinyasa and Jivamukti to Restorative Yoga Tree has something for everyone. They also offer a private session at their studios or at your place and public session at their studios. Om factory the best in NYC- just brings everything to the next level. A range of styles, from Vinyasa to Restorative yoga and even Aerial Dance, Aerial Yoga Core, and Aerial Yoga Blast are offered in Om factory. Their classes are best known for the Arial mode of yoga- the latest trend among yoga practices. There are various levels for each class type ranging from Beginner to Advanced. They also offer acro-yoga, Ashtanga, and Budokan classes. Bonus: you can get a membership for a $108. Despite the list, different people have different requirements and interests. Even the best yoga studios above might not be one you are looking for. Hence, take some time, explore different places and when you find your preferred place, the place where you like and would boost your personal growth, stick to it.